If you like Lodge's score, do nothing, and he will become AE for Katoa. If you don't like his score, swap Havili and Katoa, and get Havili's score instead. In this case, it doesn't matter when Katoa plays during the round. What matters is that both Gosiewski and Thompson play after Isaako. And also that there are no other WFBs on your reserves bench. If Isaako does well, swap Thompson and Gosiewski and get Isaako's score. In both case, you should set up the loop such that your preferred player will be active AE if you take not action. ie In case 1. I think Lodge will score better than havili, so I set it up so he will score. If I think Havili will score better, I'll put Havili in 17 and Katoa in 19. I can still swap them around after Lodge plays, but as insurance against being unable to logon, have it setup so that your preferred scorer will be in play if you don't change your team. Lodge has to be in 18 if he plays first, but Katoa and Havili can be in any order - they are the 2 that you will swap/not swap depending on Lodge's score. Likewise for case 2, I think Thompson will outscore Isaako, so I start with him ahead in the rankings. If I thought Isaako was likely to score better I would have Thompson in position 21 by default . Can always swap Gosiwski and Thompson at any point before they play, so place them in the order you think you'll want them. That way if you forget, or can't logon to swap, it won't be as harmful. Also keep in mind that in both cases, you are not guaranteed to get a higher score. In case 1, Lodge might score 35, so you decide to use him as AE. Havili could score a double and get 55. Or Lodge could score 25, so you play Havili instead, he gets a 2nd minute HIA and scores 1 point. This is possibly the best situation you can get for a loop. Ideally for this to work Gurgess plays on Thursday night. Leleisiuao and Mitchell play Saturday or later. Holmes and Hurrell have to be the highest ranked CTR and WFB on your reserves. If Gurgess kills it early. Swap Leleisiuao for Holmes/Hurrell and then swap him again for Liddle, to put Gurgess in as AE. This is a rare case where you do not risk missing out on a higher score. You can guarantee the highest score for your team and make your swap decision accordingly. Will be hard to set this up on a regular basis however as it requires multiple players having the right DPP (or not having DPP at all) and playing in a convenient order. I was very keen on Brodie Croft during pre-season. I talked him up heavily, and thought he was a shoe-in for 40+ scores. I feel its a bit wrong of me then, to sell him now to cut my losses. I know it is within the rules of the game that I can remove Croft from my team, but I think swapping him out for a cheaper player producing better scores is a bit of a loophole. Should I keep Croft around to suffer the full value of his losses, rather than taking the coward's way out and trying to dodge some of the dropped cash. PS - in reality, Croft went from my team ages ago. But then again, I am also a proud loopholer. I also buy items when they are on sale. Main thread is full of poolhopping talk. So anyone here want to help me with trade options for the week? @Pain wrote: Does this loophole work? In this scenario, to maximize the power of the loophole, play TPJ in your 13 at FRF exchanging him with a non-dual FRF, leave Teddy where he is in 18. Play Kikau at 20. Switch Rochow for a non-dual 2nd Rower. Now wait for Teddy and Kikau to play. Choose which of their scores you want to get. If you want Teddys score, you can move Griffin into the interchange before he plays and you get his score. If you want Kikaus score you can move Griffin down to 21. Because TPJ is dual and his team plays late in the round and so do Tigers, you can also switch TPJ and Rochows positions. Without seeing the full squad it is hard to recommend, but normally in this kind of scenario you can see 2 or 3 players play before deciding which score to take. This is why having the player in the 13 is much better than having them on bench / emergency. You get lots of flexibility and options. Now who needs to keep quiet on what they don't know they are talking about? Mate, I have read this post three times now and it makes zero sense. I have no idea what you are suggesting Pain does here and therefore your "advice", whether or not you actually know what you are talking about, is garbage. Please if anyone can interpret this, let me know. Or if you want to try and articulate your thoughts again, then go for gold. But until then you might want to keep the smart arse comments to yourself. @Milchcow does this make any sense to you - I am genuinely trying to give this guy the benefit of the doubt but to me there is no logic to this post. Who do you have at 16 in this example? have you swapped Croker for Kikau? And if so, what assumption are you working under for Croker - that he plays like he is down to? or that he's out like the rumour suggests? SO this is what you seem to be recommending. So with no changes, Lodge will go to FRF for AE and Teddy will slide into 17. Moving Griffin into interchange in 14-16 won't change that. 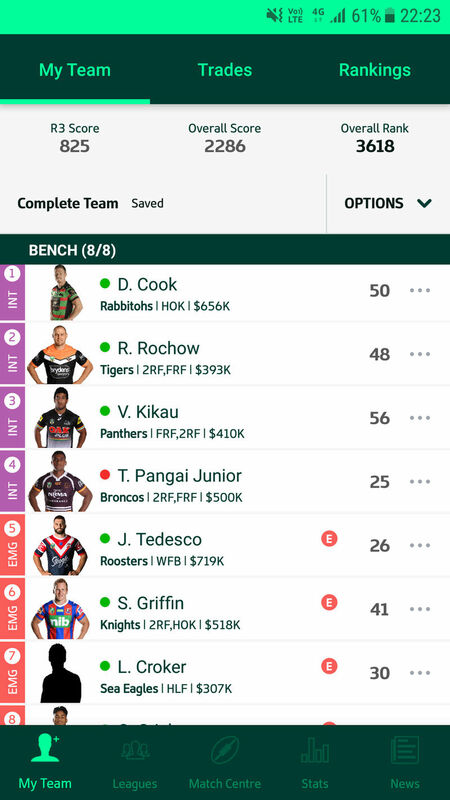 Lodge will AE for TPJ and tedesco will slide into 17, and you'll lose the score of whoever made way for Griffin. To do this you have to have a team of people playing the right position, playing games in the right order. Its not something you can reliably do every week. 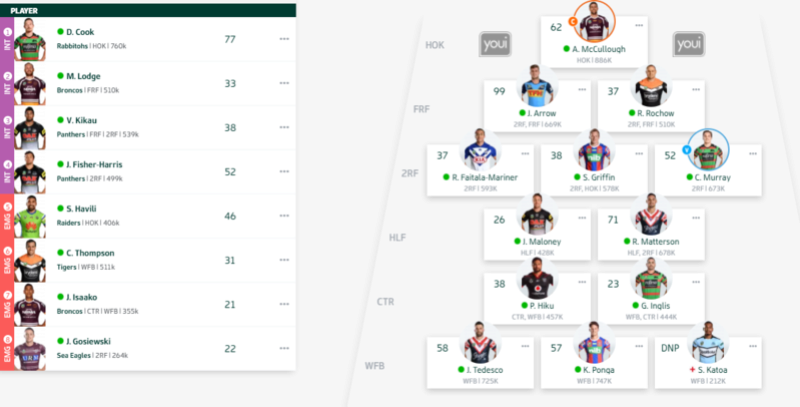 I've moved kikau into my Insurance scorer position (18) and Teddy back into the 17. My midnight brain missed that last night. I dont have the attention span on weekends for some the above techniques. One free look is enough for me and I can get it done tonight before the sugar rush of easter. I believe what hes trying to point out is that with the loophole he can get a look at multiple players but only if its in the starting team. I have Katoa as my loophole source. My other WFB are Thompson and JMK. In addition to this I also have Kikau in my emergencies as a loophole option. I get a look at Kikau and JMK as they play before Katoa is locked out. 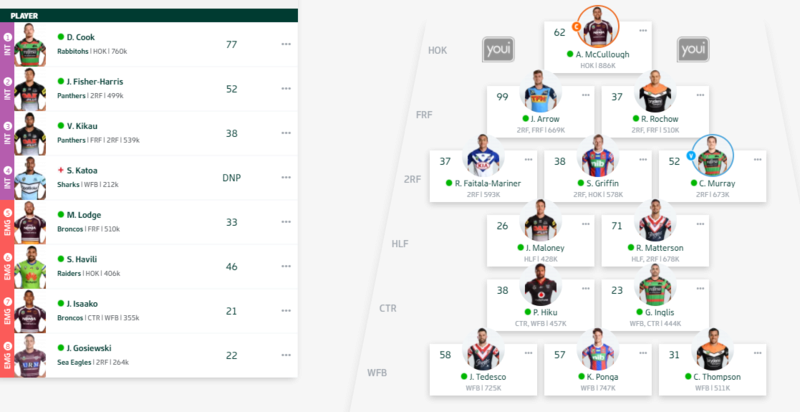 If Kikau has the best score I would swap Katoa to the bench(spot 17) (via Rochow to 21 Thompson to start). 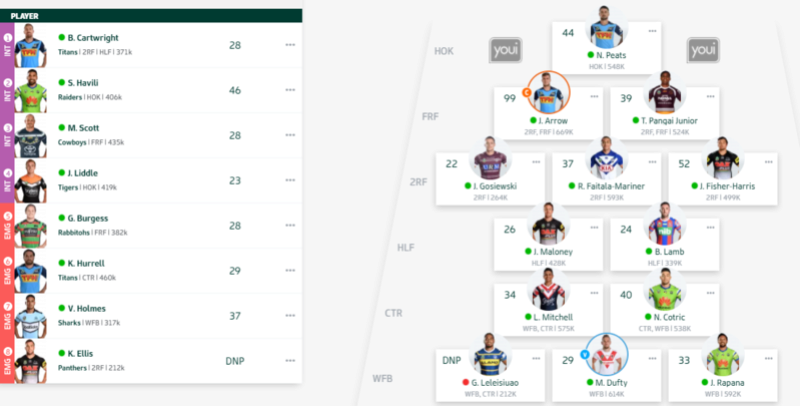 As Katoa is on the bench positions don't matter and I get Kikau as a scorer as my 18. If JMK is better I leave Katoa in the starting 13. Means my emg must come from the WFB so Kikau and Havilli are passed over for JMK. If they both score terribly I can swap Thompson with Havilii (or Katoa if I can beat the lockout) to get Thompsons score as a WFB AE as he is my highest rank WFB EMG and take Rochows points too . Agree with @Milchcow .To do this you have to have a team of people playing the right position, playing games in the right order. Its not something you can reliably do every week. What are you thinking so our poolhopping team can get started? Covers 4 desirable pooling positions at an affordable base price of 212k. Plus titans and dragons don't get many Thursday or Friday games so extra good for poolhopping. Is that its nice and simple. Want Kikau's score - do nothing, want to roll the dice with Havili - swap him in. Changes don't impact anyone else in your team. I think the issues will come in if Kikau scores something like 31. Do you loop or keep? If Kikau scores 50+ its a relatively easy decision, but no guarantees. Past 2 weeks, the popular loop choices have all gone large or tiny making the choice easy. But eventually there will be some hard choices, and people will lose points by backing the wrong horse. I’m looping for the first time this round. If it's 35 or more I won't loop. 30-34 would be really annoying and I'd sleep on it. Probably would loop. Just this alone makes a hard decision. Can't imagine trying to make a call on a more complex case like the Rochow sub out.